In a previous blog, we talked about optimizing Google product titles (Part I). In part II we’ll be discussing product descriptions. Similar to titles, product descriptions have the power to impact sales. Nielsen Norman Group’s found “20% of purchase failures are potentially a result of missing or unclear product information.” And digital marketing expert Neil Patel noticed how product descriptions can potentially impact customers’ purchasing decisions. If your descriptions cannot answer your shoppers’ questions, then they will most likely look for other stores that can. Product descriptions are meant to explain the benefits and purpose of the item’s intended use. Without sufficient details, you risk losing potential buyers. Crafting a product description may seem like a no-brainer. But if you really want to get (and keep) a shopper’s attention, it requires a bit of time and energy. Here are a few strategies to help you create effective product descriptions to attract customers. How do you write a good description? Words are impactful. A good product description doesn’t have to be lengthy or require fancy words. Remember to explain a product’s intended use, value, and important details customers may find useful. Write down a list of keywords associated with your product to give you direction on what to write. Keywords help your search engine optimization (SEO) efforts. And they provide shoppers with a better experience when searching for information overall. It’s crucial to write descriptions that will answer any questions your shoppers may have. For example, “What material is this shirt made out of?” or “Is this loose-or-tight fitting?” Product descriptions should be informative while still being simple and concise. A good product title paired with a well-written description can attract high-quality shoppers. This increases sales and broadens your audience. Figure 1. This item is from Little Dress Up Shop, an online retail store that sells costumes for children. 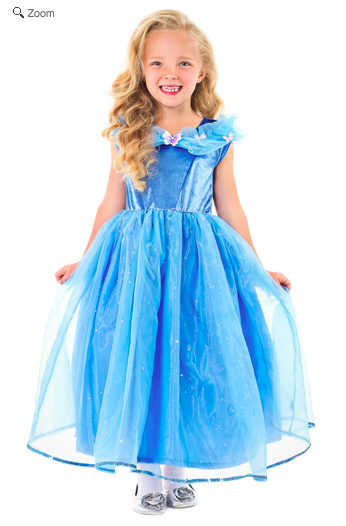 The description has the information parents who are considering purchasing a Cinderella Dress want. Keywords like comfortable, washable, and durable can encourage parents to buy. Figure 2. Here’s a woman’s dress from Tobi, a women’s online fashion retail store. The description is more straightforward than the one for the Cinderella dress. It includes relevant information such as material, fitting, and measurements. The seller also lists the model’s measurements. This gives shoppers a clearer picture of the dress’ dimensions. Both descriptions describe a blue dress and include the same type of details — i.e., fit, care, and material. But the writing styles are different due to the separate target audiences. The description found in the “Butterfly Cinderella Dress” is more playful and casual. This is fitting for the audience they are trying to appeal to: parents. In contrast, the dress from Tobi’s description is more direct and fashion-focused. Once you understand your audience, you can write according to your demographic. Next, categorize your products’ features to help organize your information. It’s easier to write descriptions for simple products. But unique products need more details. You can organize itemdetails using bullet points or icons to prevent your descriptions from becoming too wordy. Figure 3. Great White Shark Cat Ball Cat Bed. This description is entertaining to read and captivates the cat owners. This is a great example of an enhanced product description that gives the product personality (as if the shark design didn’t already). The Cat Ball shark cat bed is a great example of a product description, with the fun style of writing matching the unique product design. Its silly introduction makes the description entertaining and enticing. It’s also informative as it mentions the fabric as well as instructions on how to care for it. The description features relevant information to answer as many questions as possible. The seller also includes the specific dimensions of the cat bed such as the diameter and height. This gives browsers a better idea of the product’s dimensions. A good product description answers shoppers’ questions before they even have the chance to ask. Product description writing is like storytelling. It’s both engaging and educational and makes shoppers feel the item is worth buying. Shoppers are attracted to words that will make them feel a sense of urgency (“Only 3 available”), special (“Exclusive” or “Limited Edition”), and so on. Emma Brudner, Director of Marketing, Blog and Community at HubSpot developed a list of words that can sell. According to Brudner’s blog, power words help online sellers close more deals because they make consumers feel a certain way, earning prospects’ trust. The words you choose to use can make your listing more persuasive. Reading product descriptions can be a bit overwhelming. Be sure to organize your description in a way that is easy for readers to follow. When possible, make use of tabs and bullet points to organize information. This is a great way to prevent your descriptions from looking like a boring wall of text. 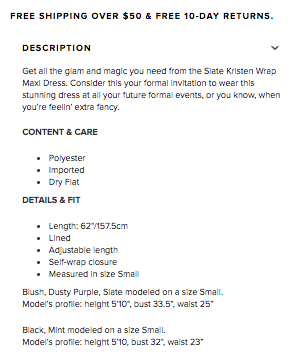 Sephora’s product description (below) is a good example of organizing information using tabs. The information is grouped into five categories: Details, How to Use, Ingredients, About the Brand, and Shipping & Returns. Figure 4. 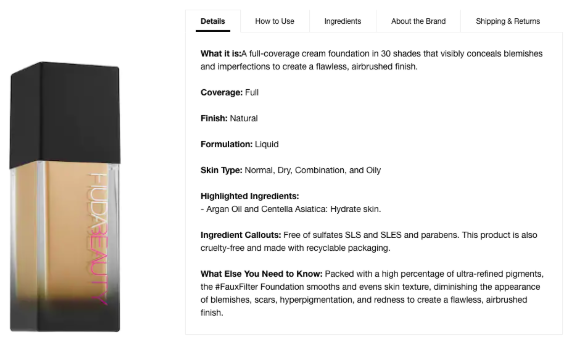 Sephora’s Huda Beauty’s #FauxFilter Foundation uses tabs. It easily organizes their information in a concise manner without overwhelming shoppers. It also serves as an easy way for customers to navigate and sift for particular details. If tabs are not available, you can format your description by utilizing capitalization, bolded text, and even colors to make information stand out. Differentiating text make everything easier to read. When planning on what to include in your description, pick the top three benefits of every feature to write about. It’s best to be informative but know what details to prioritize. Figure 5. 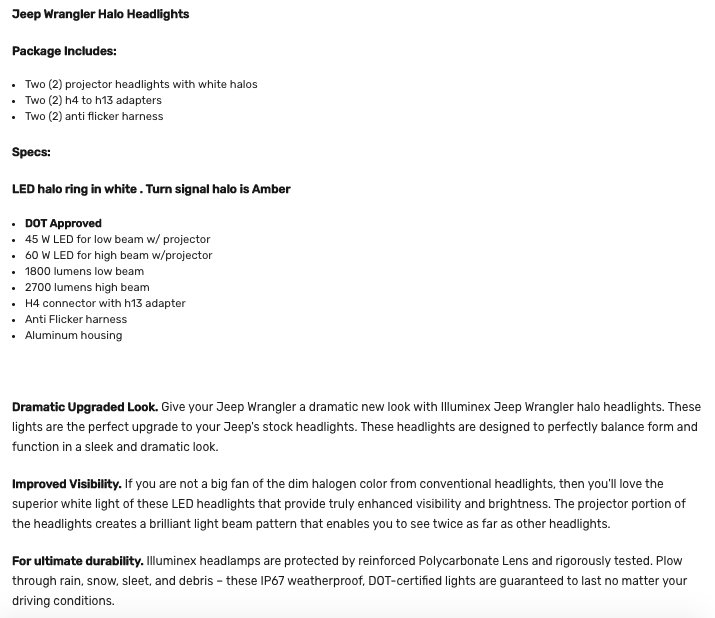 Jeep People’s Illuminex – Halo LED Headlights does not have tabs, but they format their description by using bold texts and colors for easy reading. Now, I hope you have several ideas about what to write when it comes to product descriptions. But before you go, I want to give you a few more resources, tools, and tips to help you along your journey. So it’s important to carefully select your words. I know this was a lot of information thrown at you, but I promise it gets easier the more you write. With practice, you’ll be a pro at writing descriptions in no time! Have you noticed any significant changes when you enhanced product titles and descriptions? Comment below and share your personal tips!